Baby Rhino Grey at Baby Rhino Rescue | Adopt and Donate Now! Grey was found by members of the public in November in the Kruger National Park. It was too dangerous to fly him to CFW due to bad weather, with heavy rain and thick fog making visibility very poor, so the CFW team collected him at the Kruger Park gate. The team had to cover the crate with canvas to keep the little orphan warm when he arrived later that night. He was placed on drips and after 24 hrs his condition picked up. Grey was about six months old, which means he was born in winter. The winter babies are typically less strong than rhino babies born in summer. The mother will have less food to eat, so her milk won’t be as rich. There is always extra special care given to a winter baby when it arrives at CFW. Not only was this crash all winter babies, but due to the severe drought, the condition of the babies was compromised even before their mothers’ death. They had no body reserves so they have been monitored daily. 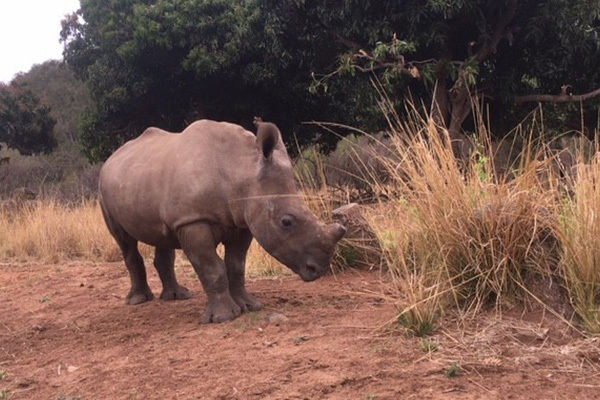 Grey was placed into a night-pen and monitored for another day before being introduced to the other young rhinos in the baby boma: Zac and Jemu. In the same week, another orphan rhino, Spirit, was added to the group. The babies grew closer over the course of the week. Oddly enough, all the calves were the same age, so they bonded quickly and easily. Grey bonded in particular with Spirit and if they are separated, they get upset! 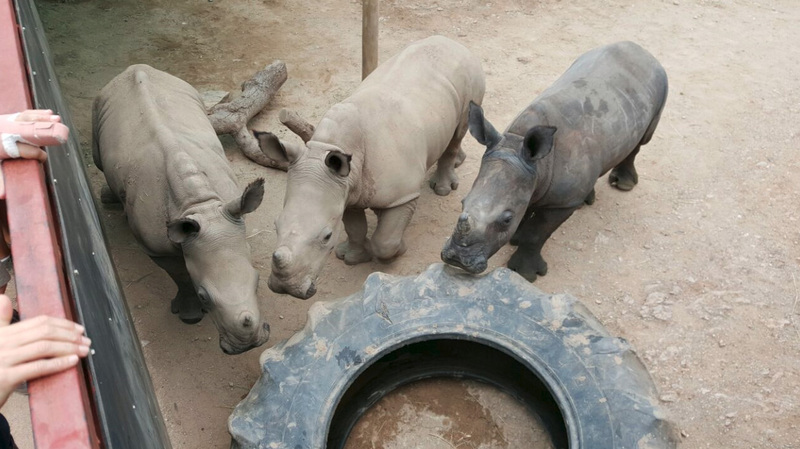 All four baby rhinos are improving and they are no longer babies, but young rhinos! Grey and Zack are big males, and they share a special friendship. BRR is thrilled that Grey was named after Matt Grossman’s son Grey. The Aryn and Matthew Grossman Foundation donated the funding for many of BRR special projects, including the stronghold, so Matt is a super VIP to everyone at BRR! It was a perfect name for Grey because he has a very distinct dark grey skin.